Looks awful. I would rather have an Horizon frigate. The Spanish government approved EUR 4.3 billion of funds for the construction of five new F-110 frigates for the Spanish Navy on March 29. The council of ministers authorization comes roughly a month ahead of the construction start which is scheduled to take place in May this year. The new generation of frigates will be built by Spanish shipbuilder Navantia with the first ship set for a 2026 delivery. F-110 frigates will see the introduction of an evolved combat management system and new solid-state S-band radar with the aim of advancing partnerships between US and Spanish industry. Lockheed Martin, the US company responsible for the development and fielding of the Aegis combat management system, is already working with Spain’s Indra on the integration of new a solid state S-band radar system which was developed for the F-110 frigates. But in recent years it has also conducted multi-ship deployments around the Asia-Pacific region, as well as taking part in large, multi-lateral exercises with more than just a single vessel. Indeed, previous Chief of Navy Vice Admiral Tim Barrett, led the change from single ship operations to the task group construct that Navy is capable of operating within today. This has been driven in one sense by the introduction of the two Canberra class Landing Helicopter Dock (LHD) amphibious warfare vessels, but another major driver has been the need for the ADF as a whole to embrace Joint and networked operations, where several perhaps disparate but complementary capabilities are harnessed together to provide an effect that is greater than the sum of the individual platforms and systems. However, Navy isn’t large enough to support continuous task groups, so each platform is required to have the capability and capacity to also operate independently. The three Hobart class DDGs now entering service provide Navy (and the wider ADF) with a step change in capability, particularly with regard to their primary air defence role, but they also represent a step forward in Anti-Submarine Warfare (ASW) capability when compared with previous surface combatants. Further into the future, the nine Hunter class frigates being acquired under Project Sea 5000 (Future Frigate) and due to enter service in the late part of next decade, will take Navy’s ASW capability to another level again. The Hunter class ships will also have the same baseline air defence capability as the Hobart destroyers, so the two designs will complement one another in the multi-ship task groups of the future. The first of Navy’s three new DDG’s, HMAS Hobart, completed a series of qualification trials in US waters last year, including intensive and complex use of the ship’s missile and gun systems. Prior to undertaking the tests, which were deemed to be a complete success, Hobart conducted a work-up period off Hawaii with the US Navy’s Destroyer Squadron 3. DESRON 31 is routinely used to work up the US Navy’s (Aegis-equipped) Ticonderoga and Arleigh Burke surface combatants prior to their deployment. “One of the great things we managed to test successfully whilst Hobart was there was the Cooperative Engagement Capability (CEC) with the US Navy (USN), for the first time at sea and the first time it has been tested with a ship from a country other than the US,” Commodore David Mann, Director General of Surface Combatants and Aviation, told ADM.
CEC is a sensor network system which fuses data and displays it in real time and which, according to US Navy sources, provides enhanced situational awareness and integrated fire control capability to rapidly engage and destroy incoming aircraft and missiles. The Navy’s second DDG, HMAS Brisbane will undergo a similar trial off the west coast of the US later this year and once the third ship (HMAS Sydney) enters service, it will undertake the same qualification process. HMAS Hobart is currently in dry dock in Sydney to undergo a series of modifications to the ship’s compartments and helicopter interfaces under the Aviation Upgrade program, which will enable the Fleet Air Arm’s MH-60R Seahawk Romeo helicopter to be fully integrated. At ADM’s annual Congress in Canberra in February Chief of Navy Vice Admiral Mike Noonan said he is considering delaying the commissioning of HMAS Sydney until late 2019 or early 2020 to incorporate the Aviation Upgrade program in the build. One capability often overshadowed by the impressive air defence prowess of the Hobart class is their ability to perform ASW roles, using hull-mounted and towed-array sonar systems. The class arguably represents the most capable surface combatant Navy has ever owned in the ASW role and will continue to do so until the Hunter class frigates enter service late next decade. “The Hobart class is delivered with an integrated sonar suite with a hull-mounted sonar, torpedo defence capability and a towed array sonar, which is not a true variable depth sonar system but it is a step up from what we have at the moment, which is no towed array in the surface fleet,” CDRE Mann explained. 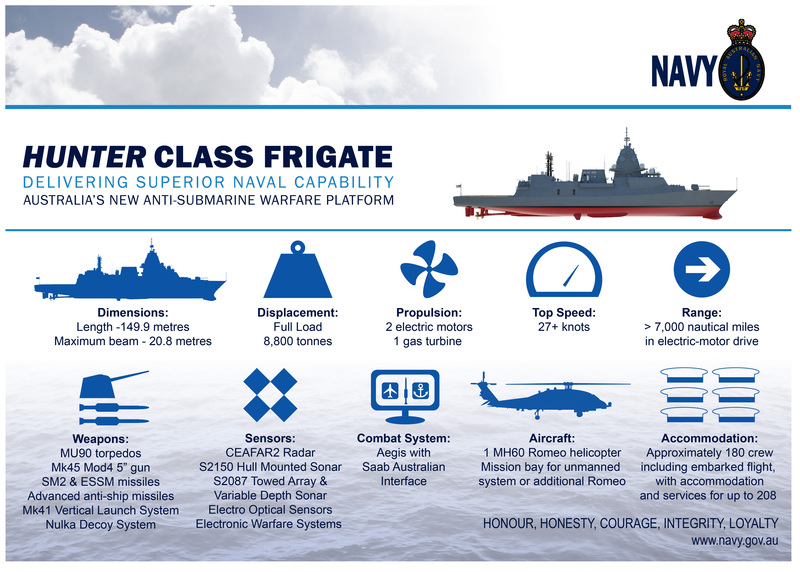 The Hunter class frigates being acquired under Sea 5000 are based on the Royal Navy’s Type 26 design, which is designed without compromise for the ASW role to replace the current Type 23 frigates, regarded by some as the best and quietest ASW vessels in the world today. However, the ship will also come with a potent air defence capability, being equipped with CEA Technology’s CEAFAR 2 radar and Aegis Combat System, a 32-cell Mk.41 Vertical Launch System and RIM-162 Evolved Sea Sparrow Missiles (ESSM) and SM-2 weapons which are both common to the Hobart class. “While the ship is optimised for ASW, it will be capable of firing the next version of ESSM, the Block 2 missile and the longer-range SM-2 and, because it will have the Aegis combat system, it will also come with the CEC,” CDRE Mann added. The Hunter class will also be capable of engaging surface targets using an advanced surface to surface missile that will replace the ageing AGM-84 Harpoon Block II missile. “We will see a big step change from the Anzac ships it is replacing – we will have 32 VLS cells instead of eight, we will have a massive increase in combat system capability from the Saab 9LV CMS to the Aegis Combat System, augmented by the Saab Australian Interface – and this combat system, together with Mk.41 VLS, allows for derivatives of future USN weapons as well,” CDRE Mann said. The nine Hunter ships will also be built in three flights, each of three ships, which will allow for configuration enhancements as technology evolves and future sensors and weapons are developed through the life of the build. “Like most of our ships, the Hunter class will be designed for combat, but it will be capable across the full spectrum of maritime tasks – from high-end warfare through to Humanitarian Aid and Disaster Relief (HADR) operations,” CDRE Mann explained. CDRE Mann says that the Hobart and Hunter ships are designed to operate together and will be operated in a similar manner to the way different classes of surface combatants have been operated throughout Navy’s 118-year history. Together however, they represent the networked future for maritime and Joint operations. The government announcement in October 2017 that it would mandate a Combat Management System enterprise across Navy’s future major surface combatants, including the Aegis Combat System with a Saab interface, and this decision has made the two classes even more compatible with one another. These systems, together with a common CEC capability and SM2 and ESSM weapons, ensure close integration of the two classes of ship. “So, in the air warfare domain you will see both Hobart and Hunter ships operating with RAAF assets such as the Super Hornet, Growler airborne electronic attack aircraft, F-35A and E-7A Wedgetail airborne early warning and control platform, both in terms of communications and tactical data links,” CDRE Mann explained to ADM.
Navy has also mandated the US Navy’s Hawk Link capability (a tactical data link format specific to the Romeo helicopters) for its future major surface combatants, and it will be retrofitted to the Hobart ships in the near future. “Hawk Link can pass raw sensor data between the MH-60R helicopter and the surface fleet, allowing an additional level of assessment over that provided by the aircraft alone, providing a deeper level of information sharing,” CDRE Mann added.